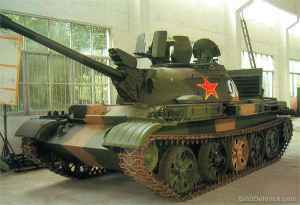 This NORINCO (China North Industries Corporation) Type 62 tank was developed from 1958 at No 674 Factory and was the first complete tank to be built in China as the heavier Type 59 was based on the Russian T-54 series MBT. Following an extensive series of trials, the vehicle was classified as the Type 62 light tank in 1962. 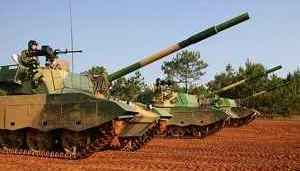 It has been designed for use in China's southern river network areas and hilly terrain where heavier vehicles such as the Type 59 MBT are difficult to deploy. 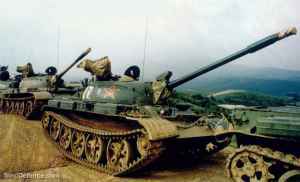 The Type 62 light tank is virtually a scaled-down Type 59 MBT and has a lower ground pressure. In addition to being used by the Chinese Army the Type 62 is also used by the Chinese marines who come under naval command. 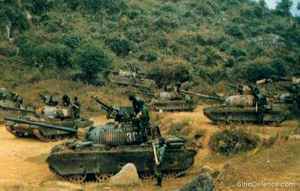 As far as it is known, there has been no recent production of the NORINCO Type 62 light tank. The layout of the tank is identical to the Type 59, with the driver seated at the front of the hull on the left and the other three crew members in the turret. The commander and gunner are seated on the left of the turret with the loader on the right. The engine and transmission are at the rear of the hull. The torsion bar suspension consists of five roadwheels with a distinct gap between the first and second wheels. The drive sprocket is at the rear and the idler at the front. Main armament is an 85 mm gun, probably identical to that on the Type 63 light amphibious tank, which fires fixed ammunition including APDS (muzzle velocity 792 m/s); HEAT (muzzle velocity 845 m/s) and HE (muzzle velocity 785 m/s). A 7.62 mm machine gun is mounted coaxially to the right of the main armament and a 12.7 mm Type 54 heavy machine gun is mounted at the loader's position for anti-aircraft use. The Type 54 is the Russian M1938/46 DShKM manufactured in China. 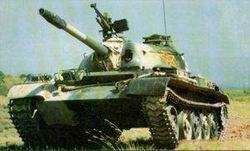 The Type 62 is not amphibious, has no NBC system and has not been observed with any infrared night vision equipment.